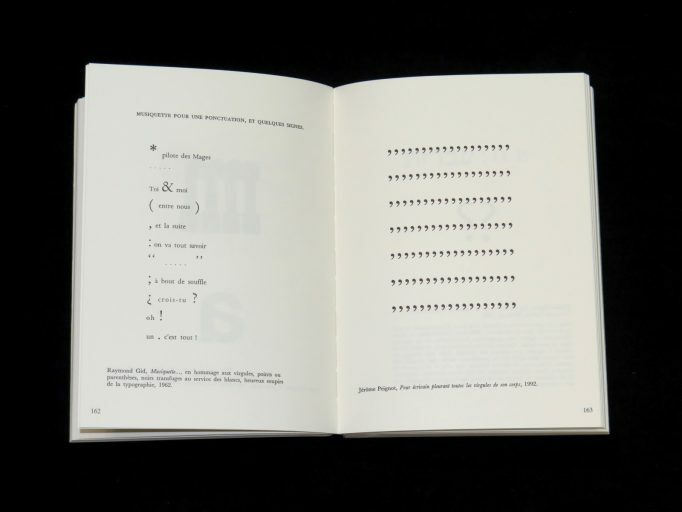 This book was the last book publish with tradtionnal type setting by the Imprimerie National, printed on heavy paper. 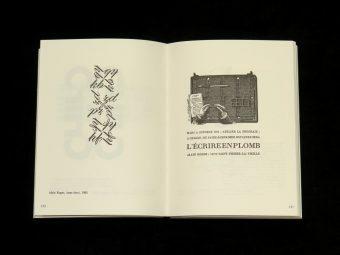 Jérôme Peignot is born in a family of typographer and type creator, his grand-father was the founder of was became Deberny-Peignot. 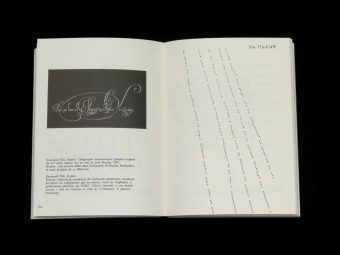 This historical enterprise worked with Balzac and his father Charles had introduced photocomposition in France and directed the Editions des Arts et Métiers graphiques. 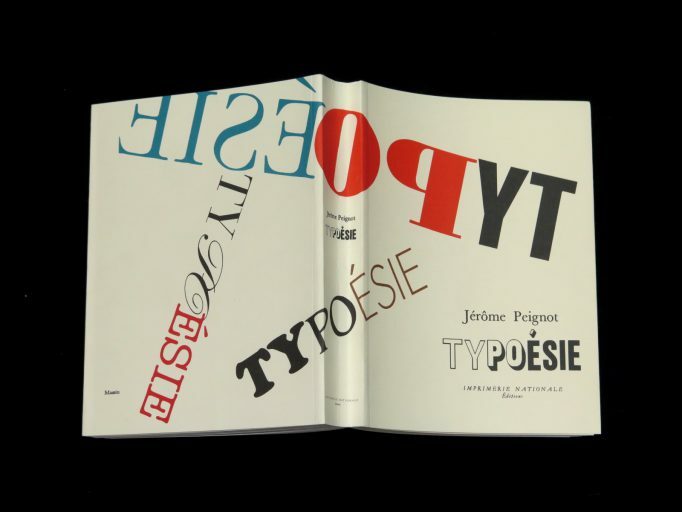 Jérôme Peignot is developping this poetry genre called Visual Poetry, Konkrete poetry or just “Typoésie” (Typoetry). 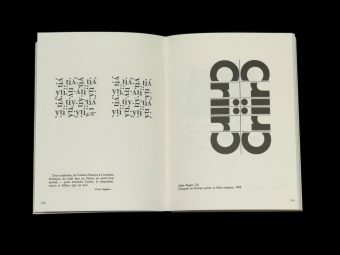 What we called a game is the meeting of litterature with typographical art: searching the meaning of the world in the design of words. 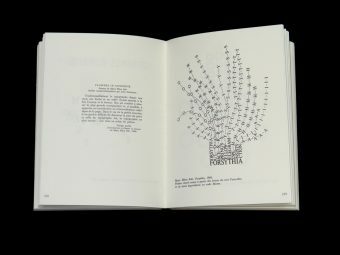 This poetry appear with the help of various tools: from letters, to punctuation, numbers and notes, this anthology is divided into five parts: Typography, Visual poetry, figures, Painting, Music. 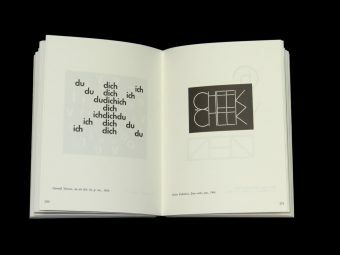 Typography: Zwart, Cassandra‘s Bifur, Lubalin, etc. 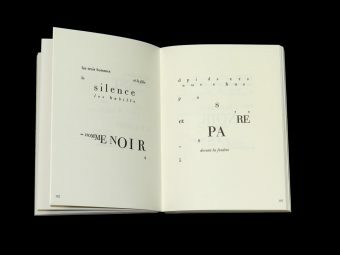 Poets: Dotremont Roubaud Crombie, etc. 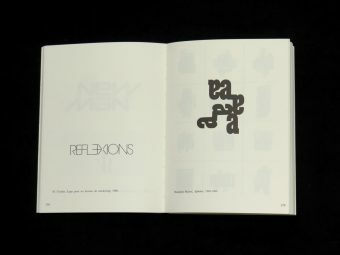 Painters: Adam Dupuy, Falconet, Hains, Kolar and Melin, Duchamp, El Lissitzky, Magritte and Matisse. Music: JS Bach, Gounod, Pobst, Ravel, Schoenberg, Webern. 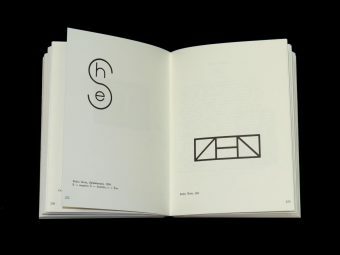 Texts by Leiris, Cassandra, Guy Levis Mano, Raymond Gid, El Lissitzky, Pierre and Ilse Garnier, Excoffon, Dotremont … and Alexandre Sorel as regards music. This entry was posted	on Saturday, July 1st, 2017 at 11:45 am	and is filed under art, graphic design, poetry. You can follow any responses to this entry through the RSS 2.0 feed.